The NACFB Commercial Finance Expo 2019 takes place on Wednesday 19th June 2019 in Hall 3A at Birmingham's NEC from 9:30am until 4:30pm. Click below to view the NEC site map. The NEC is situated 8 miles East of Birmingham city centre; its central location ensures it is at the hub of the UK motorway network. Visitors from any direction can travel to The NEC site directly using the following motorways - M1, M5, M6, M6 Toll, M40 and M42. The NEC is signposted on motorways and major roads and is marked on most good maps. If you are travelling by car, we recommend that you allow plenty of time for your journey. As a free flowing alternative to the M6, the M6 Toll offers reliably shorter journey times through the West Midlands. It runs between Junctions 4 and 11 of the M6, and there is easy access to The NEC from Junction T1 of the toll road. The NEC has numerous car parks that are more broadly categorised into North, East, South and West. All in all there are over 20,000 onsite parking spaces! 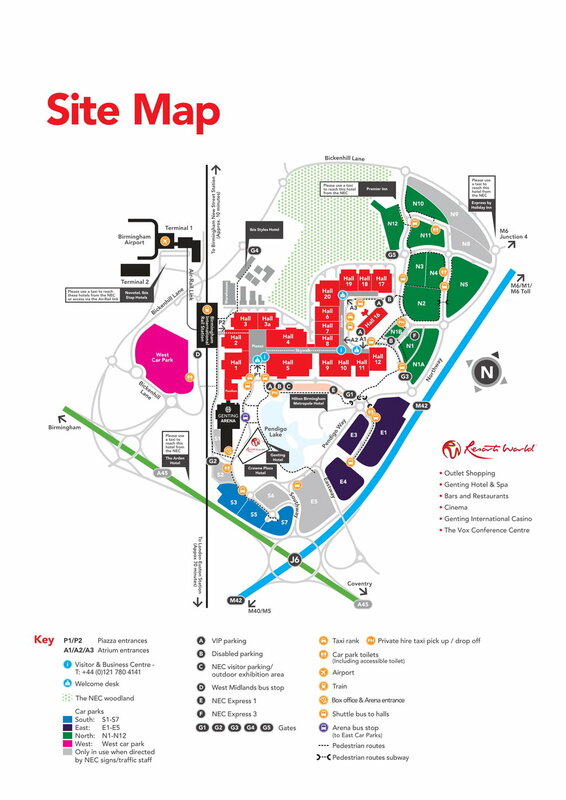 On your arrival at The NEC, traffic officers will direct you to the most convenient parking area for your event, however being such a large site with a number of entrances, it is recommended that you refer to The NEC Site Map before your arrival to avoid adding time to your journey. The NEC has designated car park spaces for visitors with disabilities. Car Parking charges are dependent upon the event you are attending, please check the What's On section on this website for more detailed information. Unless stated otherwise the cost of parking in an onsite car parking space is £12. The NEC is situated adjacent to Birmingham International Rail Station; if you are coming to a show at The NEC you can reach any of our halls without stepping outside! Depending on your origin station you can travel directly by train to The NEC by alighting at Birmingham International. If your point of origin does not provide a service directly to Birmingham International you will need to travel to Birmingham New Street first and get a connecting train from there. Birmingham New Street Station is a short journey of approximately 10-15 minutes from Birmingham International Station. Once you have arrived at Birmingham International Rail Station take the stairs or lift from any platform up to the station interchange. The entrance to The NEC is situated on the right hand side as you exit the station and is clearly signposted. Continue to walk along the covered walkway called the bridgelink where you can then follow signs to reach your exact destination. The NEC can be reached by a number of local bus services. If you are travelling to The NEC from Birmingham city centre there are two route options. The 900 service leaves from Moor Street Interchange and has a daytime frequency of 20 minutes. The 900 will drop you at Birmingham International Station with a journey time of approximately 31 minutes. The 38 service leaves from Moor Street Interchange hourly, it has a journey time of approximately one hour. The 38 will drop you off at Birmingham International Station. The National Express coach station is located in Digbeth in Birmingham city centre. National Express run services between Digbeth coach station and Birmingham International Airport. The 900 service travels from Digbeth to Birmingham International Station and has a daytime frequency of 20 minutes. The 900 will drop you at Birmingham International Interchange with a journey time of approximately 25 minutes. Birmingham New Street station is approximately an 11 minute walk from Digbeth coach station. The NEC is approximately a 10 mile journey by taxi from Digbeth coach station.